The drawing below presents some internal structures in the brain, including the length of the brainstem from medulla to midbrain. 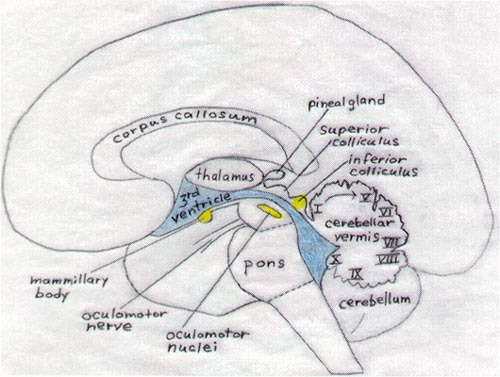 The subcortical third and fourth ventricles are shown in blue. The aqueduct connecting the ventricles runs through the midbrain. The tectum (roof) of the midbrain lies above the aqueduct; the superior and inferior colliculi are the most prominent structures in the tectum. Tissue surrounding the third and fourth ventricles is susceptible to damage from toxic substances. The oculomotor nuclei, mammillary bodies, and inferior colliculi (highlighted in yellow) are prominently damaged by alcohol intoxication. Other auditory nuclei such as the superior olivary complex are also vulnerable to factors that disrupt aerobic metabolism. Kemper and Bauman (1998) reported visible abnormalities within the mammillary bodies of some individuals with autism. Rodier et al. (1996) were not able to identify the superior olivary complex in the brain of one 21-one year old woman whose autistic behaviors may have resulted from prenatal exposure to alcohol. 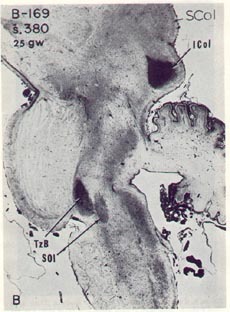 The picture above can be compared with that to the right, which shows myelin formation in brainstem auditory structures of a human fetus at 25 gestational weeks (from Yakovlev and Lecours, 1967, with permission from Blackwell Scientific Publishers). The dark nuclei that have taken up a special stain for myelin are the trapezoid body (TzB), the superior olivary complex (SOl), and most prominently the inferior colliculus (ICol). 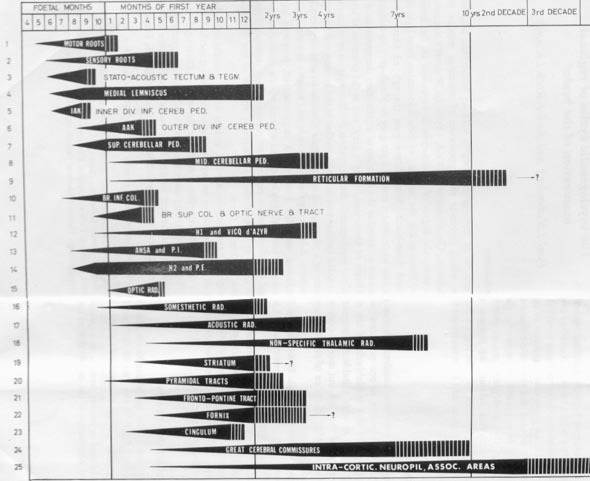 As can be seen from the diagram below (also from Yakovlev and Lecours, 1967) only two systems are fully myelinated before birth. The stato-acoustic tectum is the inferior colliculi. Early myelination of the auditory system has recently been confirmed by Moore et al. (1995). Kemper, T. L. & Bauman, M. (1998). Neuropathology of infantile autism. Journal of Neuropathology and Experimental Neurology, 57, 645-652. Moore, J. K., Perazzo, L. M., & Braun, A. (1995). Time course of axonal myelination in the human brainstem auditory pathway. Hearing Research, 87, 21-31, & 91, 208-209. Nolte J, Angevine JB (1995) The Human Brain In Photographs and Diagrams. St. Louis: Mosby. Rodier, P. M., Ingram, J. L., Tisdale, B., Nelson, S., & Romano, J. (1996). Embryological origin for autism: developmental anomalies of the crainial nerve motor nuclei. Journal of Comparative Neurology, 370, 247-261. Sokoloff, L. (1981). Localization of functional activity in the central nervous system by measurement of glucose utilization with radioactive deoxyglucose. Journal of Cerebral Blood Flow and Metabolism, 1, 7-36. 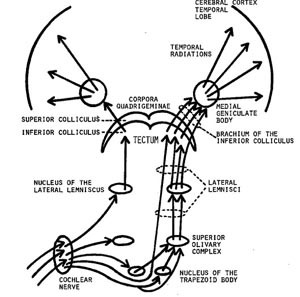 Truex RC, Carpenter MB (1969) Human Neuroanatomy. Baltimore: Williams & Wilkins. Yakovlev, P. I. & Lecours, A.-R. (1967). The myelogenetic cycles of regional maturation of the brain. In A. Minkowski (Ed. ), Regional Development of the Brain in Early Life (pp. 3-70). Oxford: Blackwell Scientific Publications.